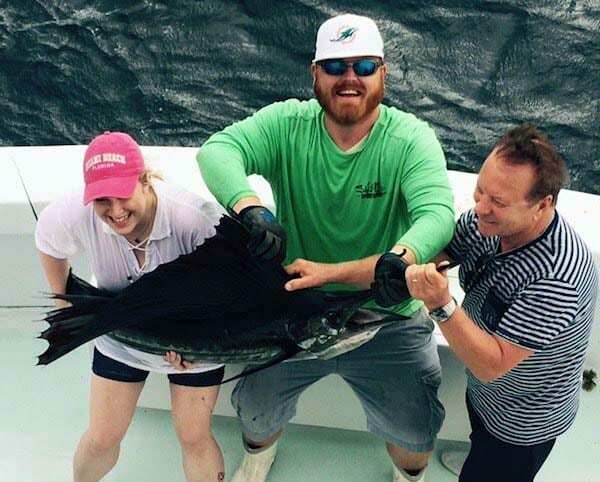 Miami Sailfish Fishing Trip … This past week we have seen some amazing trolling for Sailfish off Miami and Miami Beach. 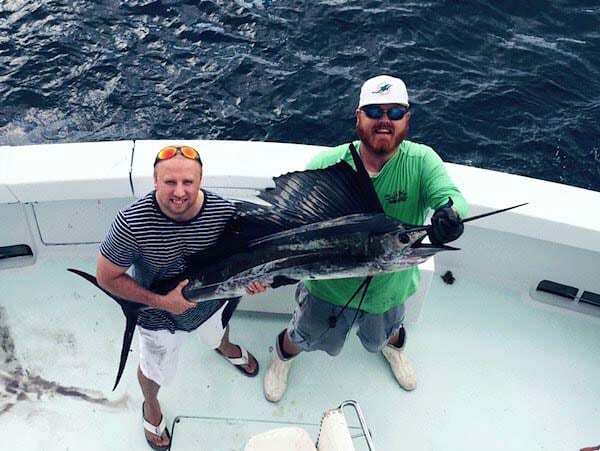 Every year in September we see groups of Sailfish migrating into our area from up north and from the deep ocean. These Sailfish find the edge of the deep reef and or the Western edge of the Gulf Stream. The groups of Sailfish find large schools of Sardines and other bait fish. The schools of baitfish congregate on the edge of the deep reef. The groups of Sailfish will follow the migrating baitfish. This time of year we troll baits that imitate the smaller bait fish like Sardines, Flying Fish or Herring. One of our most effective rigs is a six inch bird teaser rigged with either two small feathers. We rig each feather on an independent leader. The leader material is typically 60 pound monofilament. The lures or “bugs” we use are small squids in blue and silver or other color combinations. I like to place them over a quarter ounce feather or mylar. We also use small chuggers with or with out a small bonita strip. When I use a small chugger with a strip bait I use only one leader on the bird. We also troll small Ballyhoo either skirted or placed behind a sea-witch or chugger. Another very effective combination is a small Bonita strip behind the same skirts, sea-witch or chugger. I place the birds in the short riggers. The natural bait and lure combinations are trolled just behind the bird rigs. I like all of the baits close enough so a group of fish that rise up in the spread can see all of the options.